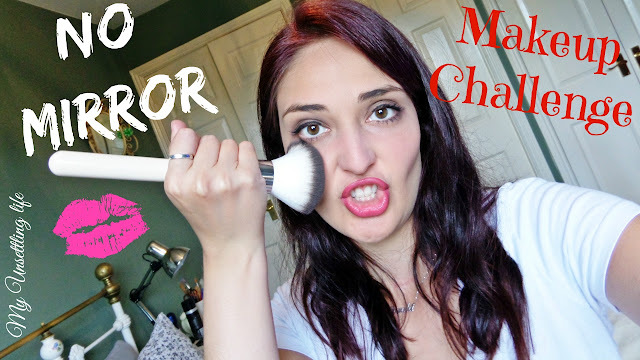 No mirror makeup challenge - spiced up! I've been wanting to do this challenge for a while now, and every time I tried filming my camera would decide not to record or to die on me. But I managed this time. Hehehe. I also wanted to make it a little harder for me, so I decided to mix up all my makeup and not look at what I was grabbing, feeling the makeup I thought was right by touch. The consequence is that the video is slightly longer than usual. But it also has some bloopers. So if you want to have a laugh, go ahead and watch it. Also in this video I dare you to try the same challenge and then walk outside your house with your weird makeup, and film it all. If you send me the video of you doing it, I will take up the challenge as well, do a worst makeup and walk outside with it. Not sure I'm brave enough for that! Mind you I rarely find the time to wear make-up since the kids monopolise the bathroom so I'm usually au naturel - does that count as a no make up challenge?